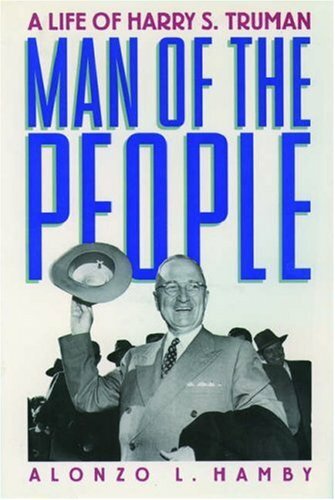 “Man of the People: A Life of Harry S. Truman” is Alonzo Hamby’s biography of the 33rd president. Hamby is a historian, an expert on Harry Truman and distinguished professor of history emeritus at Ohio University. His most recent book, “Man of Destiny: FDR and the Making of the American Century” was published last year. This biography of Truman is well-paced with nearly half of the book’s 641 pages devoted to his pre-presidency and the remainder focused on his presidency and two-decade retirement. It is the product of meticulous research, a thorough understanding of Truman and deep insight into his era. Published three years after David McCullough’s bestselling classic, “Truman,” Hamby’s biography is undoubtedly meritorious. But where McCullough’s narrative is consistently descriptive and intensely engaging, Hamby’s style is more often that of a sober, analytically-oriented history professor. McCullough places the reader at the scene of the action; Hamby delivers a serious and erudite lecture filled with penetrating historical insight. Some readers will fault Hamby for covering his subject’s early life too quickly – Truman’s first few decades are covered at the rate of about a page per year. And anyone seeking to understand the mature Harry Truman away from politics will find comparatively little focus on his personal life. Pervading the narrative is a sense of scholarly detachment which provides the impression that Truman’s actions are being carefully judged…but without any sense of literary warmth or intimacy. And as Truman first enters Missouri politics with support of a local political boss, the book becomes so detailed that all but the most patient and devoted of readers risks losing the forest for the trees. On the other hand, Hamby does an excellent job dissecting many of Truman’s personal relationships – particularly with his family members. And he does a far more skillful job explaining the inner-workings of Kansas City’s Pendergast family political “machine” – an early and consistent political sponsor of Truman – than I’ve seen anywhere else. The chapter covering Truman’s service as the leader of an artillery battery in World War I is among the best descriptions of his military service I’ve read. And the final chapter of the book (bluntly titled “Who He Was, What He Did, and Why We Care”) provides the most thoughtful analysis of Truman and his legacy that I’ve encountered. Overall, Alonzo Hamby’s biography of Harry Truman fails to provide a consistently exciting or interesting reading experience, but will leave committed members of its audience remarkably well-informed. Readers partial to a more dynamic literary style will find this biography too clinical and antiseptic, but budding historians and serious students of Truman will revel in the political detail and insight it reveals. Truman seems so bland. I can’t imagine reading 700 pages on his life. I’d rather spend the time reading a Pendergast biography. I have to admit that Truman was not quite as exciting as Andrew Jackson, Teddy Roosevelt, et al… Having said that, I’ve been looking for “the definitive” Tom Pendergast biography but haven’t found it yet. If it exists, I’m sure it’s a great read! ‘Bland’ or not, your praise of the last chapter– “Who He Was, What He Did, and Why We Care”) provides the most thoughtful analysis of Truman and his legacy that I’ve encountered”–persuaded me to engage in this book (as soon as I finish the incredibly well done tome on FDR by Jean Edward Smith. Thanks again for your always illuminating insights. I hope you’re enjoying JES’s bio of FDR – it was my favorite of the bunch (and I liked quite a lot of them!) I really did like Hamby’s last chapter – it was a solid finish to a book that was pretty good, but not great.